When selecting your solar panels for home it is worth it to conduct a small research to determine the type and the brand of solar panels in question because not all solar panels are equal. Today, there are so many players in the solar manufacturing industry and it is worthwhile to take some time to assess the different solar brands that are out there in the market. Since, there are so many solar panel brands in the market, this article only attempts to list a few important things that you may want to consider to determine the best solar panels for your home. Currently, a lot of solar panels are manufactured in various countries, including but not limited to China, USA, Germany, Japan, Mexico Philippines, India, Thailand, South Korea, Malaysia, Taiwan and Brazil. However, most solar manufacturing is done in China with two-thirds of the world’s solar production capacity while half of the world’s new solar panels are being bought in China. Also, it is projected that in the coming years, China and the rest of Asia will have 77% of all PV (photovoltaic) solar panel manufacturing. In addition, a report conducted in 2015 by the GTM research saw U.S. as a top destination for solar panel manufacturers. The solar analysts pointed out that U.S. ranked higher than any other high-cost country for solar panel manufacturers because of its robust domestic demand and access to other markets globally. So, why should you consider the solar panel brand when selecting your best solar panels for home? Not all solar panels are manufactured equal and this affects the quality of your solar panel which in return affects the overall performance of your PV system as well as the long-term reliability of your solar panels. This is because factors such as capital investment, use of sophisticated manufacturing techniques such as use of robotics, research and development and application of robust quality control systems; have a huge impact on the end product (solar panels) being manufactured. In addition, the type of raw materials such as silicon and other materials that are used to make solar panels will also affect the performance of solar panels. 1. Solar manufacturers should be able to honor their warranties for the warranted life of a solar panel (usually 25 years). Solar panels come with two types of warranties: a performance and equipment guarantee. Solar performance warranty guarantees that the solar panels in question can produce upto 80% of their original capacity after 25 years (the lifespan of many solar panels). With performance warranty, a specific solar manufacturer tells the consumer that you can trust their equipment and it will not degrade too quickly. On the other hand, a solar panel’s materials warranty or equipment warranty show that a particular solar panel will be replaced in the event of system failure that could result from material/manufacturing defects or even environmental issues. 2. The best solar panel brands will manufacture their solar panels with the highest grade of silicon. Such solar panel manufacturers will invest heavily in research and development while using highly advanced robotic processors to make their solar panels while employing some of the best quality control systems. Such solar brands will produce highly reliable solar panels that are high performing and will have trust for their solar panels with the best solar warranties in the market. Solar panels will come with different ratings labeled on them including but not limited to solar panels efficiency, temperature coefficients, power outputs etc. Checking these parameters is the best starting point to help you determine which solar panels are good for you based on your system needs. 3. Solar manufacturers that invest heavily on R&D may be able to offer the best solar warranties because of the use of the latest innovative solar cell technology that is able to determine the best solar panels in terms of increaased solar module power output, high system reliability and outstanding low irradiance performance. The best solar panels are able to withstand harsh environmental conditions such as heavy snow load, high temperatures etc. 4. The best solar manufacturers will have many years of operation at least over 5 years or more. They will either be publicly listed on a stock exchange or have a strong and stable balance sheet. Such companies may have a high degree of vertical integration and possess a good track record of great performance in the industry in terms of where their solar panels have been installed or deployed, their reliability and performance. With a long-term track record, it means the company is financially capable or bankable and will be around for years or decades to honor the warranties placed on their solar panels. By joining these online solar market places you will receive multiple solar panel quotes from different solar panel installers that work with different solar manufacturers. Also, in their online solar platform you will be able to compare prices, solar panels efficiencies from different brands and warranties of different solar PV brands. 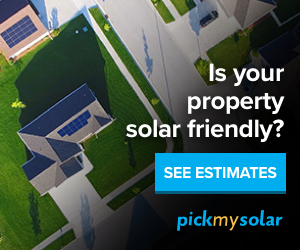 Join EnergySage and Pick My Solar today to learn more.